Steve Okakpu Emeka celebrates his winning goal for Letterkenny Rovers against Cockhill Celtic on Sunday. Photos: Brian McDaid. 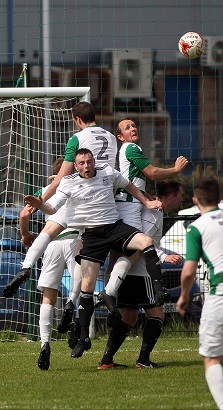 The champagne is back on ice after Steve Okakpu Emeka struck a memorable winner to give Letterkenny Rovers the win they needed to force the Ulster Senior League title race to a play-off. In a closely-fought encounter at sun-drenched Leckview Park, Okakpu Emeka scored a brilliant goal on 85 minutes - his half volley from the edge of the area rocketing in past keeper Lee McCarron in the Cockhill goal. The goal came after Rovers had turned the pressure up on the visitors and they probably just about deserved to win it. Okakpu Emeka was one of three substitutes brought on by Rovers manager Eamonn McConigley in the second half and all three players had a positive impact for the winners. That's my boy . . . Anthony Gorman congratulates the match-winner Steve Okakpu Emeka after Sunday's game. The result means these two sides will meet in a play-off for the title on Wednesday, June 6th at Dry Arch Park, Bonagee. Cockhill came to Leckview in the knowledge that a point would be good enough to secure a sixth successive USL title. They started well, without creating any chances of note, with Malachy McDermott and Mark Moran catching the eye for them in a pretty even first half. Letterkenny, once they settled into their game, soon began to enjoy some good moments too. David Shovelin, Kevin McGrath and Ryan Lonergan were excellent as Rovers tried to find an opening goal but aside from a good chance which fell the way of Darren McElwaine on 35 minutes, Cockhill didn’t really look in any trouble. In the blazing sun, the heat was a factor for both sets of players and while the game opened up a lot more after the break, both defences were still well on top. Rovers did have the ball in the net when a Ryan McConnell goalbound effort struck Paul McVeigh and while the ball went into the bottom corner, McVeigh was in an offside position. Chris Flanagan was unlucky to see a deflected effort loop just over the bar while McDermott drew a save from Rory Kelly as Cockhill began to mount some pressure of their own. But as the game wore on and Rovers exerted more and more pressure on Cockhill, one of countless free kick deliveries from Garbhan Grant ended with Okakpu Emeka delivering a cracking finish to break Cockhill’s resolve. It was tough on Cockhill, who were back by a large number of travelling supporters. But they will have a chance to hit back next Saturday night when these sides meet again in the final of the Donegal News League Cup at Maginn Park, Buncrana. Letterkenny Rovers: Rory Kelly, Ryan Lonergan, Chris Flanagan, Conor Tourish, Ryan McConnell, Kevin McGrath, David Shovelin, Darren McElwaine (Steve Okakpu Emeka 69), Christy Connaghan, Declan Sharkey (Garbhan Grant 77), Paul McVeigh (Luke Nelis 60). Cockhill Celtic: Lee McCarron, Ryan Kelly, James Breslin, Peter Doherty, Oisin McColgan, Malachy McDermott, Marty Doherty, Gerry Gill, Gerard McLaughlin (Paul McKinney 77), Mark Moran (Liam O’Donnell 65), Ronan Doherty. Assistants: Marty Quinn, Marty McGarrigle. Kevin McGrath of Letterkenny Rovers contests a ball with Cockhill's Ryan Kelly and Liam O'Donnell.